Victus pro Scientia Opus -- Food for the Knowledge Worker: Geek Reads 2008.1: "The World Without Us"
Geek Reads 2008.1: "The World Without Us"
I got some books I had been very anxious to read for Christmas (thanks, Sis), and plowed through the first over the holidays. 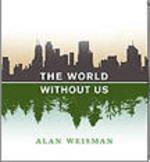 In The World Without Us, Alan Weisman answers the question: "What if all humans were to disappear tomorrow?" In a similar vein to Jared Diamond's "Guns, Germs and Steel," Weisman answers "big questions" about civilization -- except he looks forward, not back. In "What if...?" mode, he details how the planet, wildlife, and our human artifices might survive, thrive, heal, or fade away in our absence. More specifically, how would our world change if we were all to disappear at once? Cities, farms, forests, oceans, and energy infrastructure are all examined. This point made me consider whether the data that I create and manage (and help my customers to create a manage) is designed to outlast or outlive me or not, and more importantly, how much it matters. As John Maynard Keynes once famously said, "The long run is a misleading guide to current affairs. In the long run we are all dead." what is the life expectancy of my data? who will use it, and how, after I've moved on? what regulatory requirements is the organization subject to? how would someone who has never met me or worked for this organization find this information?